Second Owner Non Smoking.Mostly Highway Miles.Comes with third party dash Cam and washer fluid heater.As this is a Canadian Vehicle it has Day Time Running Lights installed as per the law here in Canada. 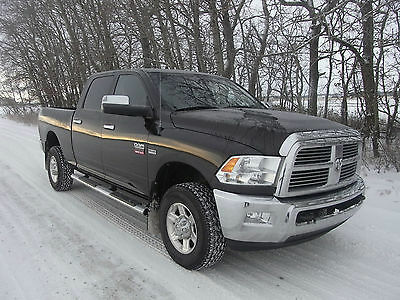 2011 Ram 2500 4X4 Crew Cab 5.7 liter Hemi Short BoxFull Leather with every available factory option installed except smokers group. Factory installed Options include: Power mirrors with electronic tilt as you enter reverse.Parking sensors and Back up Cam.110 power converter plug in.Premium Alpine 10 speaker stereo system with sub woofer, Bluetooth, DVD, U connect phone and voice, GPS navigation,Cd and external connector, Iphone connector in glove box.Wireless headphones for rear DVD.Alpine Rear passenger player DVD player , three way electronic sun roof, map lights and programmable learning buttons in top overhead console for 2x remote garage door opener .Electronically adjustable driver and passenger seats. Driver memory.Electronically height adjustable gas and brake pedals. Tilt steering with heated steering wheel.Heated and air conditioned front seats.Heated rear seatsElectronically adjustable heated mirrorsDual climate controls and center console.Manual shift on selector lever.Full towing package with trailer brake controler, 128 liter distance tank as apposed to 98 liters and 3.91 rear gearing for those big start outs or hills.18 inch aluminum wheels with chrome caps and ABS brakes, anti slip and stability control..user can turn on and off via button.TPMS tire pressure sensor system User select two wheel or 4x4, highSprayed in Bed liner Many more options just ask and I will verify anything I have missed. All major fluids including transmission have been changed inside of this year. No maintenance due at this time.On Synthetic Pennzoil platinum plus oil year round. All major recalls for the front end are completed with new tracking link and steering stabilizer shock installed as well. 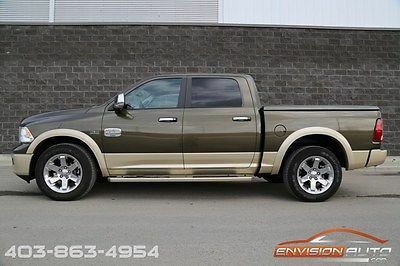 Very popular Dodge Rugged Brown, chrome side steps and chrome bumpers. Chrome door handles. *Pick up only* Acceptable modes of payment: Paypal can be used for $500 dollar deposit to hold max two business days while you arrange finance, payment. Final payment must be made in bank, Cash in person or bank transfer from recognized banking institution. All local applicable taxes, local fees and border fees are buyers responsibility All paper work and verified payment(s) must be completed locally for this jurisdiction to release the vehicle A 14 business day banking hold may apply to banking transfer if you are buying from outside Canada so plan accordingly. Free shuttle service is available from YEG Edmonton within 10 minutes of your arrival. Absolutely immaculate in every regard – ONLY 26,900 Kilometers – 100% SPOTLESS CARPROOF History Report – No Previous Accidents – No Previous Insurance Claims – As New Without the New Sticker Price! Sagebrush Pearl Coat Exterior Paint over Light Pebble Beige / Dark Brown Interior 5.7-Liter V8 HEMI MDS VVT Engine mated to the 6-Speed Automatic 65RFE Transmission -3.92 Rear Axle Ratio -Anti-Spin Differential Rear Axle -Tow Package with Class IV Receiver Hitch & Trailer Brake Control FUNCTIONAL / SAFETY FEATURES -Advanced Multistage Front Airbags -Supplemental Side-Curtain Front and Rear Airbags -Supplemental Side Airbags -Electric Shift-On-Demand Transfer Case -Antilock 4-Wheel-Disc Brakes -Electronic Stability Control -Tire Pressure Monitoring Display -ParkView Rear Back Up Camera -ParkSense Rear Park Assist Sys -Overhead Console with Universal Garage Door Opener -Memory for Radio, Driver’s Seat, Mirrors and Pedals -Security Alarm -Heavy Duty Engine Cooling -Heavy Duty Transmission Oil Cooler -Remote Keyless Entry -Sentry Key Theft Deterrent System -Remote Start System -Locking Tailgate -Electronic Vehicle Information Center -Trailer Tow Wiring with 4-Pin Connector INTERIOR FEATURES -Premium Leather Bucket Seats -Rear 60 / 40 Split-Folding Seat -Power Memory 10-Way Driver / 6-Way Passenger Seats -Power Lumbar Adjust -Heated Front Seats -Ventilated Front Seats -Heated Second-Row Seats -Premium Leather-Wrapped Steering Wheel -Steering Wheel-Mounted Audio Controls -Heated Steering Wheel -Air Conditioning with Dual Zone Temperature Control -Speed Control -Power Windows w/ Front One-Touch Up & Down -Power Locks -Power Adjustable Pedals with Memory -Rear Power Sliding Window -Auto-Dimming Rearview Mirror -Power Sunroof -Media Center 730N CD/DVD/MP3/HDD/NAV -SIRIUS Satellite Radio w/ 1-Yr Radio Subscription -506-Watt Alpine Surround w/ 9 Speakers & Subwoofer -Uconnect Voice Command with Bluetooth -GPS Navigation EXTERIOR FEATURES -P275/60R20 BSW All Season Tires -20-Inch x 9.0-Inch Aluminum Chrome-Clad Wheels -Tinted Glass Windows -Fog Lamps Call SHAUN @ 403-863-4954 for additional information. For additional full resolution photos, please visit the following link: 40 High Resolution Photos - Click Here **** USA BUYERS ***** If you are purchasing this vehicle and are a USA citizen with the destination being within the USA, there will be a $250 broker fee that is used to handle the processing of all required and necessary export paperwork at the USA border. This vehicle falls under the "NO DUTY" category so there are no additional duties or fees required to be paid at the border. This vehicle also meets all the required EPA and DOT certification and the necessary stickers of compliance are all affixed to the doors as required. We are fully capable to assist with shipping and delivery within the USA. The vehicle is located in Calgary, Alberta, Canada which is only 200 miles North of the USA-Canada border crossing. We are a fully licensed and insured dealership and can assist in all aspects of transporting your new vehicle home to you. "Buy It Now" purchase price includes NO CHARGE delivery to Montana. Once in Montana, typical open carrier truck shipping runs at roughly $1.00 per mile to your destination. We are also able to coordinate transportation between Montana and your destination as we are setup with several major trucking companies across the USA. If you have any questions at all, please don't hesitate to call or text me at 403-863-4954. Envision Auto is **CANADA's** LARGEST buyer and seller of pre-owned HUMMERS. We are located in beautiful Calgary, Alberta, Canada - just 3 hours north of the Canada\Montana border crossing. Specializing in last year 2008-2009, we currently stock over 10 H2 HUMMERS on the lot and a nice selection of ALPHA H3 Hummers. If you are looking for anything specific, please let us know to see if we can help you locate your next HUMMER. Call SHAUN at 403-863-4954 for additional information.